Last night we caught a new uncollared male, 48M. We were expecting to catch a juvenile that we had seen on the camera traps earlier, but caught a 112 pound adult male instead! He was a very polite cat — he went into the trap around 9pm last night, much earlier than many of our captures. 48M is presumably the resident male living in Loch Lomond. We’ll know more about where he lives and what he’s up to after we download his first round of data! 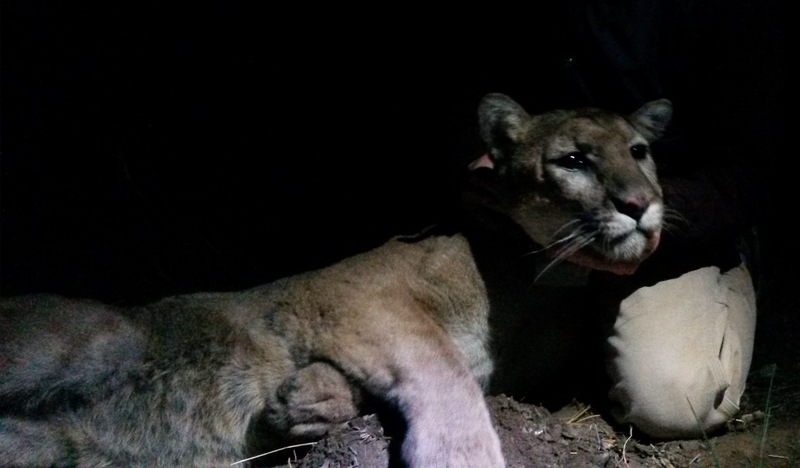 The pumas are often very calm when they’re in the trap. Sometimes they sit down to munch the bait, like we saw with 46M, and don’t seem concerned about being in the trap until we approach them. We try not to spend much time at the cage before the cat is sedated, and only approach the trap for long enough to assess the size of the animal. The size of the animal determines how much drug we give them. We were so convinced that it was going to be a small cat, that we only got a small amount of drugs. When we approach the cage with the pole syringe in hand, we quickly realized that we were going to need more than we had loaded up. It was a smooth capture and we’re excited to see where 48M goes next!